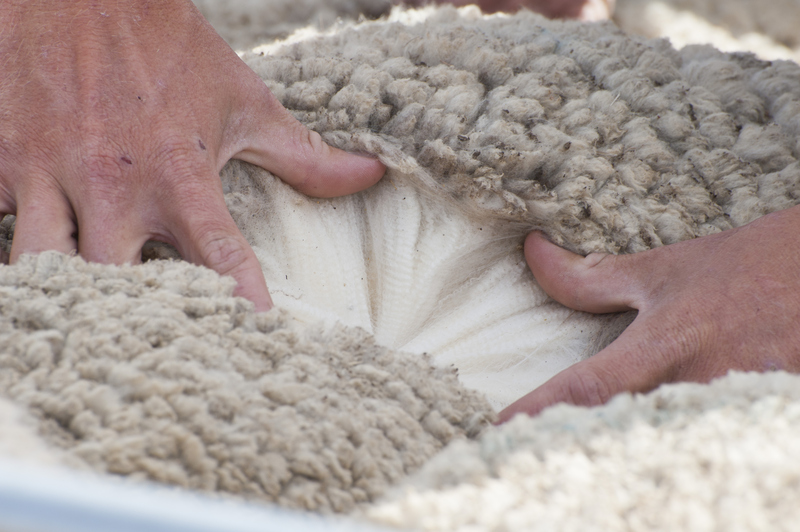 This week’s market posted a timely reminder that wool markets are not one dimensional, that is less supply does not always equate to increasing price. Supply fell and at the same time prices across the board retreated back to August levels. The Eastern Market Indicator (EMI) fell a further 53 cents on top of last week’s 21 cents fall, to end the week at 1,991 cents in AU$. The EMI in US$ terms was cushioned to some degree by a slightly stronger Au$. The EMI dropped 25 cents to end the week at 1,405 US cents (Table 1). In Fremantle, the Western Market Indicator (WMI) lost ground, falling 76 cents or 3.5% to end the week at 2094 cents. Sellers reacted strongly to the cheaper market, passing-in 19.4% or 7,013 of the 36,084 bales that came forward. This resulted in a clearance to the trade for the week of 29,071 bales, the third lowest sale clearance for this season. Of note was that on Thursday Fremantle passed-in 33% of all offered bales, while in Melbourne 31.6% of fleece didn’t make growers reserve on Thursday. In Fremantle, AEX reported that grower reaction to the lower price of Wednesday resulted in 13% being withdrawn prior to sale and a further 40% of fleece lines failing to meet grower reserve. This again produced a reduced dollar value for the week of $67.95 million, with a combined value just ticking over the $billion mark to $1.05 billion so far this season. In the wool auction weeks since the winter recess, 370,993 bales have been cleared to the trade, 60,000 fewer than the same period last year. The average shortfall cleared to the trade compared to the same time last year now sits at 5,500 bales per week fewer (Figure 2). Looking to the same sale of last season, this week’s clearance was a massive 14,000 bales fewer, and for the rest of 2017 up to Christmas, all selling weeks cleared in excess of 40,000 bales. The weekly average for this season is sitting at 33,700 and is only likely to shrink as the season progresses. While falls were generally in the order of 1 – 2%, the outlier was the superfine end where the weight of drought-affected wool caused the 16 & 17 MPG’s to pull back 4%. Cardings were particularly hard hit this week, Melbourne and Fremantle reported the Cardings indicator down 7.5 to 8.0%, while Sydney lost 6%. 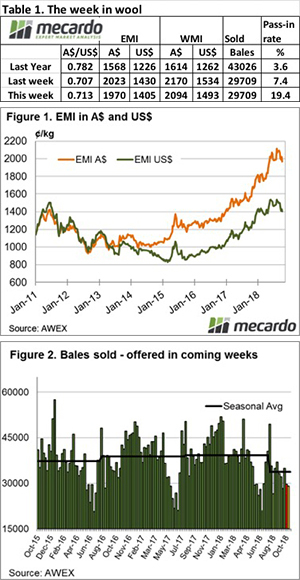 The offering next week is rostered at 38,702 bales, which is most unlikely to get to the auction as growers digest this week’s market correction. The final day didn’t provide any good news as a lead into next week, so we are likely to see a continued easing in the market as buyers try to find sustainable limits.